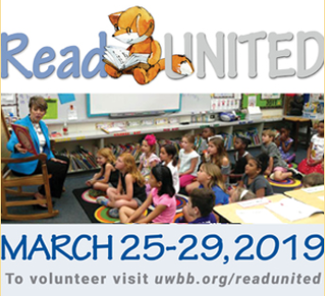 This year March 25-29, United Way of the Big Bend will engage READ UNITED volunteers to read classic tales to young children around the Big Bend Region. READ UNITED aims to ignite a love of reading in students and provide a resource to get them started on their literacy journey! Through READ UNITED, UWBB has distributed over 38,300 free books to children over the past nine years! We look forward to having you join us! Please arrive 5-10 minutes prior to your time slot. The books and your Live United tshirt will be waiting at the front office. We'd love for you to take plenty of pictures, post & tag United Way of the Big Bend!